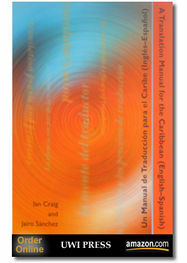 This website offers material to supplement the printed text A Translation Manual for the Caribbean (English – Spanish) / Un Manual de Traducción para el Caribe (Inglés – Español), published by the University of the West Indies Press. It is hoped that this linkage of printed with virtual text will encourage students to move easily between these parallel media, treating translation as both the highly respectable craft or art of producing finished works, but also an open-ended intertextual adventure that the internet has facilitated to a previously unimaginable degree. Some of the content of the web page simply reproduces that of the printed work for convenience: this is the case with the Notes, which here allow one-click access to web page references that would otherwise have to be typed. Equally, reprodction here of the source and target texts discussed in each chapter allows readers to keep these continually before them – if they have access to the web – whilst consulting the relevant Commentary, which may be on other pages in the printed text. Other material does not appear in the printed text. This is the case with the “Alternative Translations” of source texts that appear in Chapters 1, 2 and 4, which are “hidden” here for consultation after the reader has attempted their own translation; or the Additional Web Links page, placed here for ease of access and updating. The web-page Glossary of translation terms reproduces the printed version, but includes an alphabetical directory at the head for ease of reference. Again, this facilitates reading for those able to consult the printed text whilst enjoying access to the web, by avoiding jumping between different pages.